Recently, a previous client approached us to upgrade their kitchen. Heart Kitchen & Bath had actually designed and supplied the custom “Shaker” style kitchen 20 years ago. 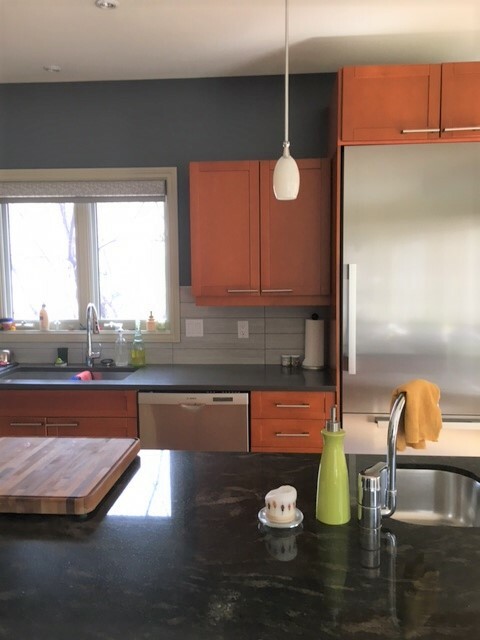 As the “Shaker” door style is still fashionable and the cabinets were still in excellent condition, the goal was to modernize the space while maintaining the “bones” of the original space. Since the basic kitchen design was very functional and still suited the client’s needs, our recommendation was to replace some of the upper cabinets with a matte lacquer finish in an effort to create a two tone kitchen. Being respective of the current tile backsplash, we specified a stunning rich Grey colour for the new cabinets and sourced out some dark handles for other existing cabinets. The island was spruced up with a new countertop, new plumbing fixtures, and new lighting. Given the age of the kitchen, new appliances were also required. In this regard, we were very lucky to accommodate a Miele steam oven in the existing design. The clients remembered that 20 years ago, a certain pro-active Heart Kitchen designer suggested that they plan for a future coffee maker or steam oven! The 60 cm pantry was designed to accommodate the future appliance. Magically, we removed one door and the Miele steam oven fit like a glove! Check out these before and after pictures – completed in July 2017.